The late-mid 1730s were transitional years for Handel, to put it nicely. At the dawn of his 50s, the composer was confronting financial troubles and an English public whose tastes were rapidly forsaking Italian opera in favor of English burlesque works on the model of The Beggar’s Opera (something called The Dragon of Wantley, in part a send-up of Handel’s Giustino, was the toast of the 1737 season). Though still dabbling in the opera game, Handel was already turning toward the oratorio form which would dominate his creative output for the rest of his life. Serse (1738), the odd fruit of this tumultuous period, is the Handel opera for anyone who has ever felt personally victimized by having to sit through too many da capo arias. Writing for the roster of B-list singers he had to work with by this time, Handel abandoned his mainstay forms for simpler ariosos of varying lengths, and, in a possibly cynical ploy to siphon off some burlesque opera fans, introduced comic elements usually forbidden in pure opera seria. Though Serse was a resounding flop at its premiere, the flexible scene structure feels refreshingly spontaneous to a modern audience and the mix of comedy and drama boasts uncanny shades of the tonal complexity achieved in something like Marriage of Figaro 40 years later. 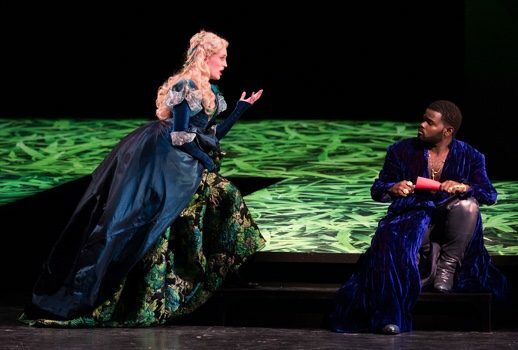 While the Glimmerglass Festival’s new Xerxes is consistently engaging, preserving the work’s winning qualities with solid musical values and an exciting star turn, this production ultimately feels pleasing but limited. This is in part due to a lack of much interpretive innovation (it would definitely not look out of place in a playlist of those late 1990s Handel productions one frequently stumbles across on YouTube), and in part due to the young cast, comprised almost entirely of young artist program members or recent graduates (as seems to be Glimmerglass’ standard practice these days). While offering much to appreciate and certainly some names to remember, realizing the full dramatic impact of baroque opera is trickier than banging out a good Tosca, and a production featuring a critical mass of singers still in various stages of development can probably only go so deep. Adapted from a hand me down libretto previously set by Cavalli almost a century before, the plot mostly avoids any heavy historical stuff and just embroils the Emperor in a byzantine set of romantic intrigues. Written for the prickly castrato diva Cafarelli (fun fact: Cafarelli was later imprisoned for humiliating a soprano colleague with obscene gestures while they were onstage together), Xerxes towers over the rest of the cast in dramatic and musical demands, spinning from sensitive melancholy to boiling rage as his efforts to wed Romilda are thwarted by the other characters. Returning to Glimmerglass after last year’s Cato in Utica, John Holiday, Jr. showed himself more than equal to these demands, with a hugely promising foray in the title role. Holiday offers something a bit different from the creamy, full-bodied sound we associate with many of the reigning countertenors. It’s a more focused, pointed tone, almost nasal at times, which gives an impression of lightness and delicacy while easily projecting into the hall (at least in the intimate Busch theater, can’t quite tell how he would fare in a bigger space). Holiday made much of that beautiful sound, delivering exquisite effects in the lilting dynamics of “Ombra mai fu” and Xerxes’ other more plaintive numbers. Though relatively firework-free in comparison to Handel’s usual standard, Xerxes does get two big showpieces, the furious “Se bramate” which closes the first act and the even angrier (and pettier) “Crude furie degl’orridi abissi” towards the end of the second. Though some countertenor pitfalls emerged here and there (a few whooping attacks, the occasionally anemic run) Holiday exhibited the genuine fire and confidant virtuosity needed to put these numbers over the top. The lovers which Xerxes attempts to break up, Arsamenes and Romilda, were sung here by Allegra De Vita, who has made a strong impression in the last few seasons in the Washington National Opera young artist program, and Emily Pogorelc. De Vita’s warm, attractive mezzo sounded gorgeous in her extended second act lament “Quella Che Tutta Fe” while Pogorelc showed off a steely, impressively-sized soprano in her “E gelosia quella tiranna” and other numbers, just occasionally sounding pinched in her upper register. Romilda’s sister Atalanta turns out to be one of the most intriguing characters in the opera: though she mainly serves as another, bawdier lady foil for the lovers, she is assigned her share of dramatic material as well. Soprano Katrina Galka demonstrated impressive range here, consistently nailing the comedy while evoking real sympathy in moments like a poignant, beautifully shaded second act “Voi mi dite che non l’ami,” in which the scheming Atalanta reveals the true depth of her feeling for Arsamenes. Mezzo Abigail Dock delivered an earnest performance as Xerxes’ long suffering fiance Amastris, who spends most of the work disguised as a man (gotta get creative when you’re competing with a tree), though she seemed a bit miscast vocally, reaching for low notes and sounding effortful in some of the fioriture. The show’s broadest comedy found a strong champion in bass-baritone Calvin Griffin, who brought scene-stealing confidence and an expansive sound to Arsamene’s servant Elviro, while Brent Michael Smith lent a sturdy bass to Romilda’s father Ariodates, who inadvertently foils Xerxes’ plans. Conductor Nicole Paiement displayed a fine, thoughtful feeling for Handel’s score, maintaining just enough momentum to keep things interesting while never pushing the band’s comfort level, though pokey pacing in a few of the arias slowed the action at times. The Glimmerglass pit, despite some added period instrumentation, is not about to transform into a compelling baroque orchestra, but they mostly rose to the challenge, some intonation and stridency issues in the strings aside. Serse’s intriguing elements of gender-bending and megalomania are mostly left on the table in director Tazewell Thompson’s straightforward production. Direction of the singers was efficient and comedy handled well enough, though Thompson occasionally falls into the trap of thinking Handel arias aren’t interesting enough and tossing in some unmotivated surplus blocking. Indeed, the strongest ideas on stage seemed to come from the eye-catching, inventive costuming by Sara Jean Tosseti, for example, the shirtless floor length sparkly gold duster Xerxes wears to close the show. Lighting (by Robert Wierzel) in gaudy shades of pink and green nicely enhances the visual interest of the costumes against a functional series of platforms and the default classical-looking scenery fragments of John Conklin’s set.